Rome and Israel were in constant conflict for the first 200 years of Rome’s occupation of Palestine. Jesus, as a highly religious Jew, was part of that conflict and was executed for it. Jerusalem was besieged and the Temple destroyed in 70. After the umpteenth uprising, the Romans finally kicked the Jews out of Palestine in 135. Israel: only one God, and no prayers or worship of anyone or anything else. Rome: thousands of gods, worship your own and those of other religions. Christian compromise: only one God… except He has three “persons”, one of which is Jesus… so it’s OK to pray to any of them… also to Jesus’ mother… well, and to any other of God’s angels, saints, etc… but it still counts as only one God. Israel: God only cares about Israel, God’s Chosen People – ignore everyone else. Rome: local gods care about local people, so the bigger the Empire gets, the more gods care for it. Christian compromise: God cares for everyone who believes in Him, so keep making His empire bigger. Israel: love Jerusalem, hate Rome. 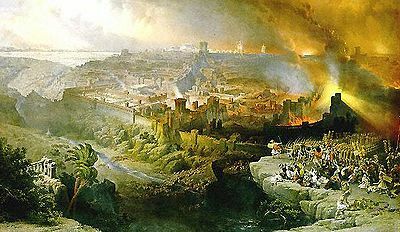 Rome: destroy Jerusalem, Rome is the center of power. Christian compromise: make Rome the center of the Jerusalem-focused religion. Israel: 7-day week. Rome: 8-day week called “nine days” (inclusive reckoning). Christian compromise: 7-day week called “eight days” or “Octave” (inclusive reckoning). Israel: Passover. Rome: Saturnalia. Christian compromise: Saturnalia traditions at Saturnalia to celebrate Jesus’ birth, Passover-type traditions at Passover to celebrate Jesus’ death. Israel: circumcision of males mandatory. Rome: are you crazy? Christian compromise: circumcision of males voluntary. Israel: detailed dietary and food preparation laws. Rome: eat anything. Christian compromise: no prohibitions most of the time, except Fridays and Lent. And so on. It’s fascinating. And for a long time, it worked.